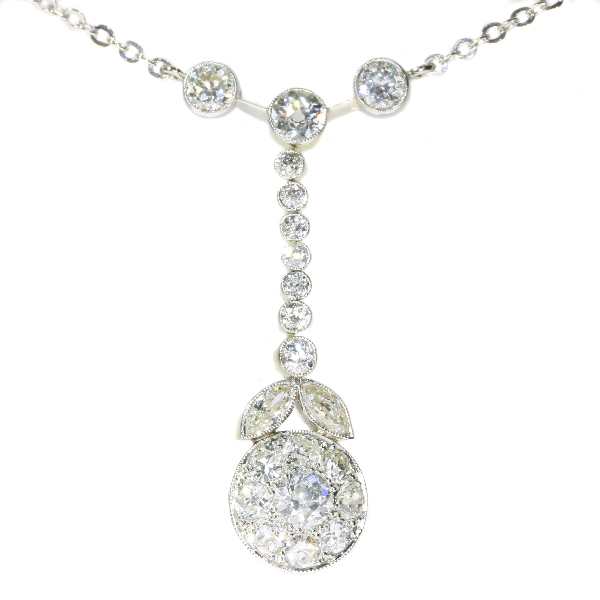 French Art Deco diamond pendant: Description by Adin Antique Jewelry. Diamond(s): One brilliant cut diamond with an estimated weight of ± 0.35ct. Three brilliant cut diamonds with an estimated weight of ± 0.60ct. Eight brilliant cut diamonds with an estimated weight of ± 1.00ct. Seven brilliant cut diamonds with an estimated weight of ± 0.21ct. Two marquise (or navette) cut with an estimated weight of ± 0.20ct. Total diamond weight: approx. 2.36 crt. (average colour and clarity: F/I, vs/si). Hallmarks: The French control mark representing a "mascaron" (French for "grotesque mask") that was in use in France from 1912 and used for into France imported platinum jewelry and objects. Although it carries a typical French control mark representing an owl , we cannot be sure it is actually French as the owl was also used for items in finished condition that were brought to be examined by the French Assay office (the eagle’s head was used for items brought in unfinished).